When agriculture produces crops that man, cow and sheep can consume with more profit, the goat retreats to the mountain tops and the wilderness, rejected and despired - hated too as the emblem of anarchy. There's plenty of that in the Klamaths. Wilderness I mean. 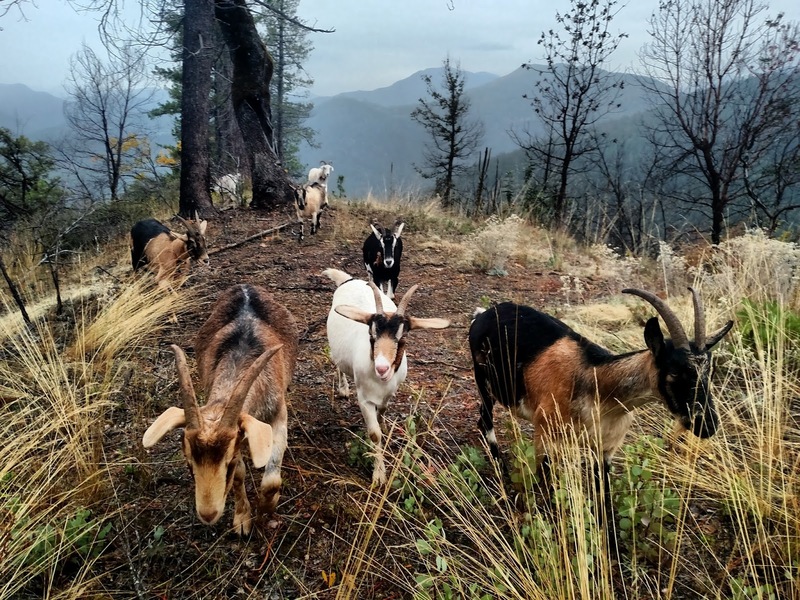 One mile from the nearest neighbor and eight miles from the tiny town of Happy Camp, the homestead of Bryan and Laurel lies deep in the Klamath National Forest, with its endless "Knots" of near-vertical slopes and deep, brambly ravines. 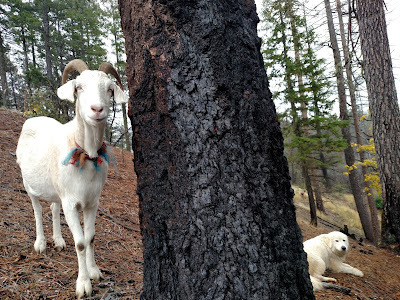 Goats are perfect for such a homestead. 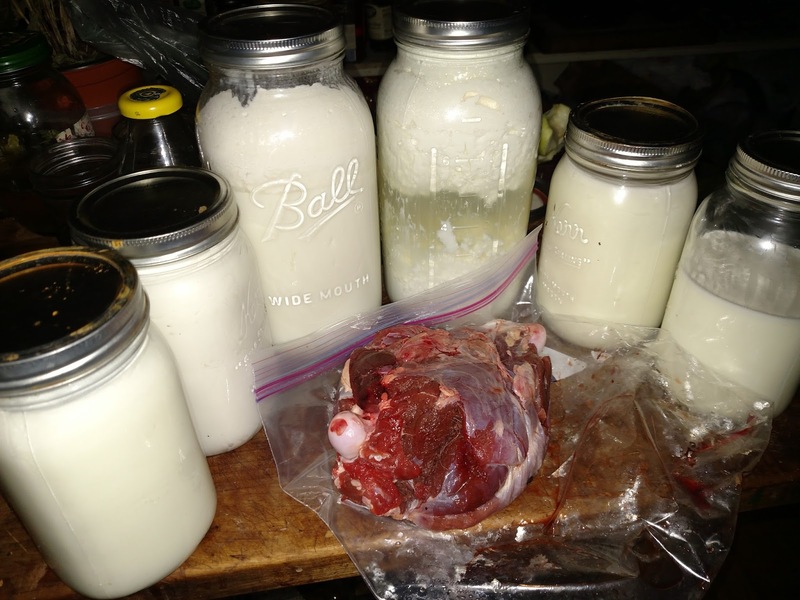 They contribute milk, meat and cheese to self-sufficiency. And their tendency to devour vegetation makes them valuable tools in ecosystem management. Homesteading near derelict land has its ecological challenges. Mining from 160 years ago stripped the soil down to bedrock and sterilized the salmon streams [See Homesteading in the Klamaths - Part One]. More recently fire suppression and invasive species have overgrown the meadows and choked the forest floors. Such overgrowth is the greatest ecological problem here, according to Bryan. To the goats its a delicious solution. Increase soil moisture - less vegetation is absorbing and transpiring. Improve salmon habitat - sediment and debris move more freely into streams. Restore native vegetation and ecosystem diversity - the blackberry is no longer smothering them. Such effects would occur after repeated grazings weakened and eventually killed the target vegetation. In other cases, correctly-timed grazing may actually benefit certain plants. For example, pruning back grasses and herbs may promote their regrowth, similar to how bison and fire regenerate prairies. Grazing also contributes organic matter to soil via root dieback (i.e. 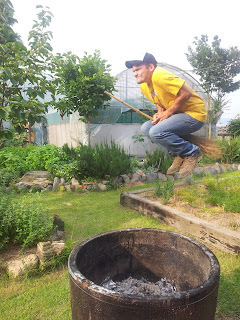 when plants lose above-ground mass and shed below-ground mass in proportion), as well as fertilization via manure. In either case, watching their gradual impact on the landscape is a fascinating aspect of goatherding, as Bryan says. 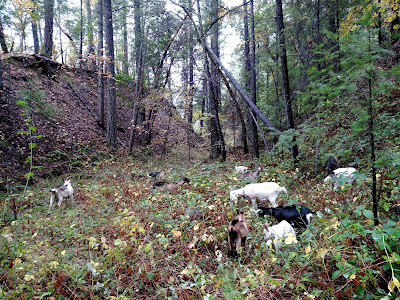 To illustrate, I've tracked their handiwork in the two photos below, before and after four passes through a ravine of blackberry with sixteen goats. Why Goats, not cows or sheep? surefootedness and agility on 80-degree slopes. Everything. Bark, moss, mushrooms, leaves and shoots of any plants, grass, berries, banana peels - anything except woody branches or what has already been trampled. 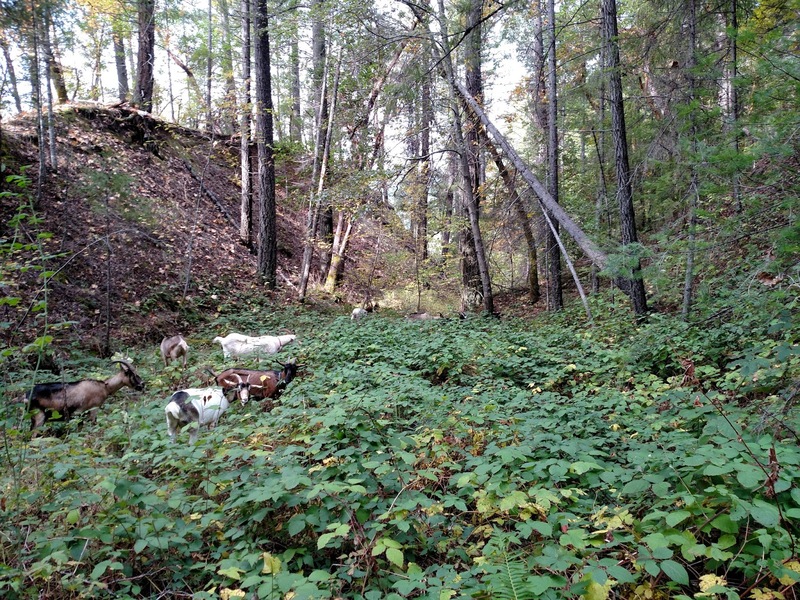 In fact, the forests sustain the herd entirely - no feed bills - thanks in part to Siskiyou County's 'free grazing' laws on public land. 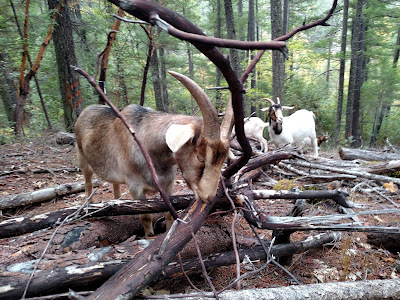 The goat is an animal easily sustained in wild and uncultivated regions where it finds ample supply of food from the spontaneous production of nature, in situations inaccessible to other quadrapeds. 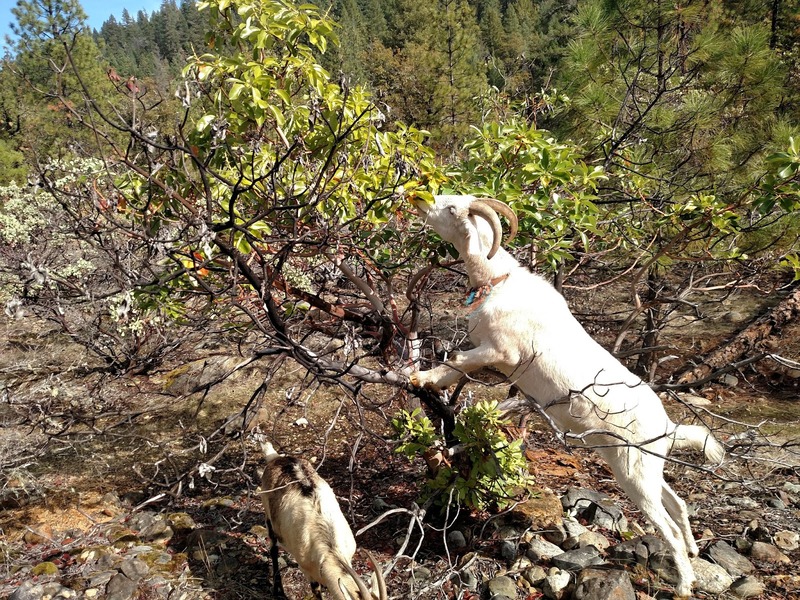 Goats assault a patch of invasive Scotch Broom. 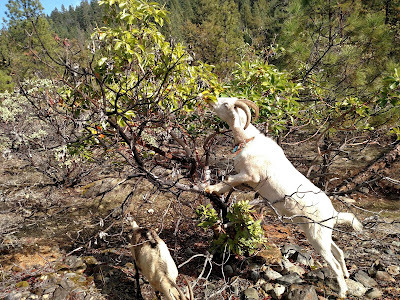 Falcor versus a stunted madrone on former minesite. Goats enjoy the peely park of madrone, like "chips" Laurel says. 1. Keep Moving - If you lose initiative, they'll wander. On open ground or intersections that means dispersion and ultimately chaos. The first of two tips from Bryan himself: hold momentum. Trails and ridgelines can help channel their momentum. 2. Keep it tasty - On one occasion I tried leading the herd up a rocky slope, and, sensing a lack of food in their near future, they ignored me and turned down a lush ravine. Grassy flats, dense blackberry patches, burnt forests of resprouting oaks -- a string of such feasts keeps them trusting in your guidance. Massive apple tree on former homestead site. 3. Keep in front - Sheep and cattle react to threats by squeezing together and moving directly away, making it possible to push a herd from the rear. 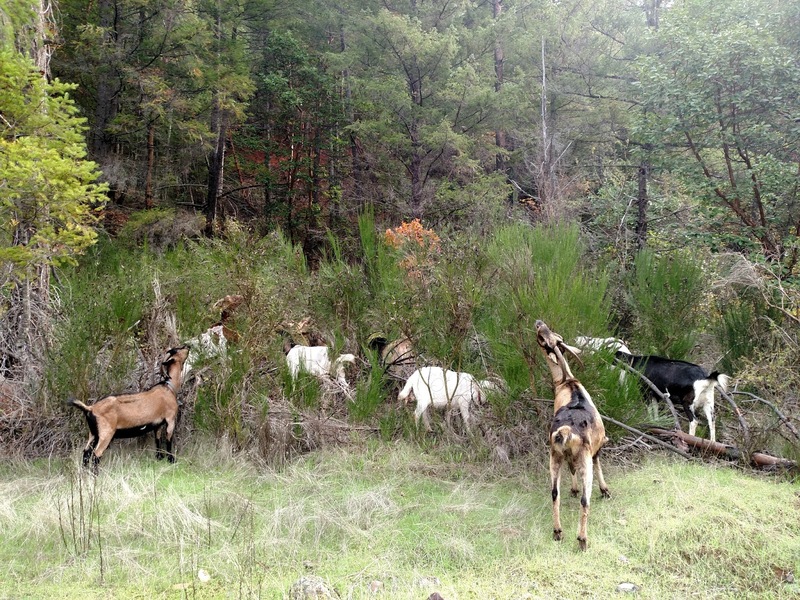 Goats, however, may scatter or take defensive stances. 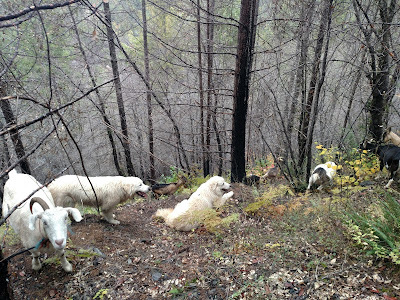 This behavioral difference alters the logistics of herding. Steer from the driver's seat and harness their 10,000-yr old instinct to follow the human holding a stick. 4. Keep calm - Falcor the Large may test your authority and your front kicks. Detachments of the herd may be led astray by the oblivious influence of the Three Stooges. And Giddie may choke herself out on her own collar. Herding can be stressful. Even with the above tips, "sometimes they have their own plans," Laurel told me one day after the herd undermined my intended route. So heed Bryan's second tip: don't take it too seriously; they'll find their way home eventually. Goats in the midst.. of munching madrone bark. Falcor proudly sporting his bow-tie of busted restraints. 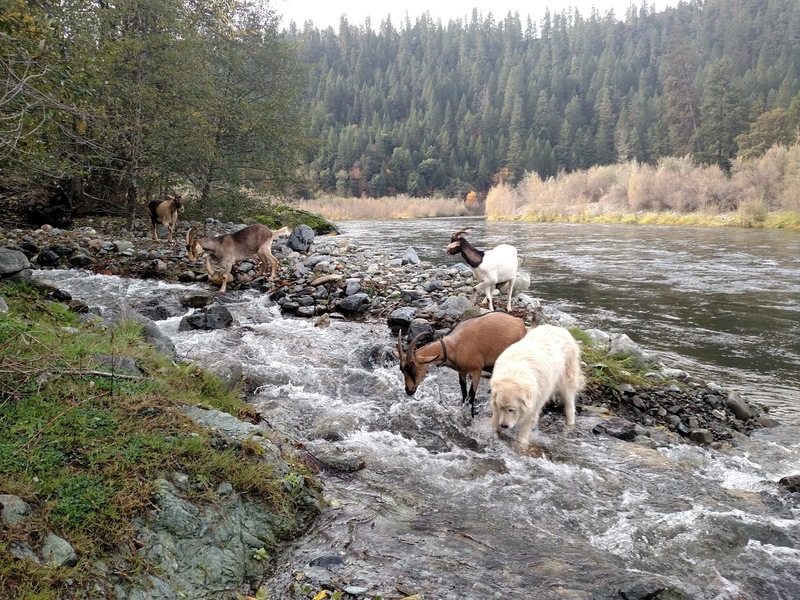 Goats crossing China Creek where it meets the Klamath River.